I have another installment featuring two more Color Club Treatments, Smooth Operator Tinted Ridge Filler and Smoother, and Dry Ice Drying Drops Rapid Nail Lacquer Dryer. It's taking me a while to get through all of them, because I want to put them to the test and use them several times before discussing them. My first review focused on Loosen Up Cuticle Softener and Remover, and Cuticle Soothe Conditioning Cuticle Oil, which you can find here. Smooth Operator Tinted Ridge Filler and Smoother: This is a dual purpose product which acts not only as a smoothing ridge filler base coat, but can also be used to enhance a natural nail color look by using it alone as a polish. It has a very mild pink/beige tint that gives a slight tint of color to your natural nail, or adds a little 'underwear' for a colored polish applied on top of it. I've used this several times now alone and as a base coat, and find it to be very effective. The formula is of medium consistency and it applies very evenly, leaving my nails with a smooth finish that camouflages the fine vertical ridges. I keep a ridge filling base coat on my desk that I use on occasion if I'm applying a sheer color that I feel needs something fairly opaque under it. This is to keep me from having to apply more than 2-3 coats of the color. My go-to ridge filler is Orly Ridgefiller, but I much prefer the Color Club product for two reasons...make that three reasons--it's much less expensive! First, the Orly product is almost too white and I have to really be careful not to get any near my cuticle. It tends to pool a bit and I seldom take the time to do any clean-up when I'm swatching (I've really been admitting my laziness to you lately!). I get very disappointed when I go to edit photos and there's that telltale white clearly evident on the cuticle. Smooth Operator is such a natural shade and the formula flows better, so I don't have that problem when I use this product. The second reason is that it really works nice all by itself. The Orly product is a little streaky and I would never consider wearing it alone. Smooth Operator gives my nails a very smooth and even finish with just enough of a subtle tint to make then look 'finished'. Price: Smooth Operator (.5 fl. oz.) is available at various eTailers and price ranges are $2.38 (Texas Beauty Supplies**) to $4.00+. Dry Ice Rapid Nail Lacquer Dryer (Drying Drops): This product claims to dry all layers of polish in less than one minute. The bottle cap has a push-button top to draw up the product into the glass applicator tube. I apply a drop or two at the base/cuticle area of each nail about one minute after I've applied my top coat or final coat of color if I'm skipping the top coat. Always tilt your nails slightly downward so the product flows over the nail toward the tip. My nails are dry to the touch after a minute, and it seems to add some gloss to the polish when I haven't used a top coat, even long after I've applied it. I typically reach for Zoya Hurry Up when in need of drying drops, and Dry Ice is very similar to that product. I had previously used Avon Liquid Freeze, but I much prefer the convenience of a drop applicator over Avon's spray bottle. I really don't notice any difference at all between the Zoya product and the Color Club product performance-wise, other than the lower price of Dry Ice. Price: Dry Ice (.5 fl. oz.) is available at various eTailers and price ranges are $2.75 (VNS) to 4.00+. 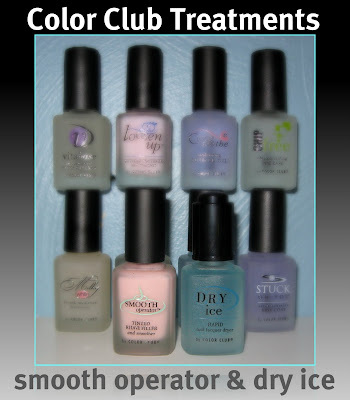 Now that I've used 4 of the treatments so far in the Color Club line, I can say that I'm finding them very comparable to many other similar products from other brands, with the only primary difference being a lower price. If you need to know the ingredients of these products, let me know and I'll contact Color Club/Forsythe and send them to you. **Texas Beauty Supplies offers the lowest price on the Smooth Operator, but I have never ordered from them, nor am I familiar with them. *Products featured were furnished by the manufacturer or PR firm for review. I really love their polishes so its nice to hear their treatments are just as nice! This is good to know. Once I run out of the Zoyq Ridge Filler I'll try the Color Club. Zoya is mostly clear but it's more expensive. I also like that the Color Club has some color to it. Thanks for reviewing this. I'm going to have to give my Dry Ice another try. I used it the other day along w/ their base coat & top coat. It took over an hour for my nails to dry. Plus it actually smeared my color.